In a state with so many beautiful mountainsides, it’s impossible for the kid in all of us not to want to slide down a few of them once the snow melts each summer. Several Colorado amusement parks have created alpine slides that zoom you down the hillside as fast as you can handle — all with amazing mountain views. After a scenic six-minute chairlift ride, bobsled (without the snow, of course) down 3,000 feet of slide that drops more than 600 vertical feet. While you’re there, check out the resort’s mountain-bike trails, gold panning, bungee tramps, human maze, zipline, climbing wall and many other family activities. This fun park in Glenwood Springs has an alpine slide/roller coaster hybrid called, of course, the Alpine Coaster. The car is fixed to a track, so while you still control your own speed, you can shoot faster through hairpin turns and bumps without getting ejected. Once you reach the bottom, you’re pulled 1,000 feet back up to the starting point — a good time to enjoy wildflower views! The Breckenridge alpine coaster, Gold Runner Coaster, has elevated tracks to thrill you down 2,500 feet of mountainside (here, your car is also fixed to the track). 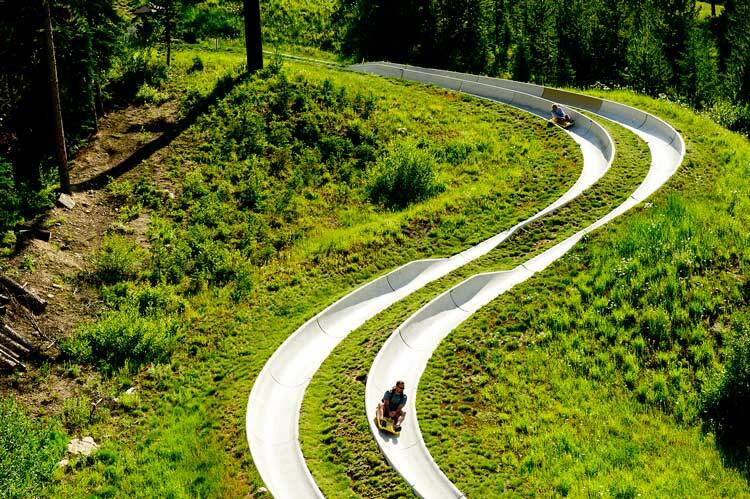 They also have a typical alpine slide that gives you three different tracks to choose from. The park also offers a zipline, 4x4 and guided hiking tours, mini golf, scenic chairlift rides, gemstone panning, a climbing wall and other family favorites. The Howler Alpine Slide is located at the top of Howelsen Hill and offers a cruise down 2,400 feet of banked turns, while the Outlaw Mountain Coaster at Steamboat Ski Resort is the longest coaster in North America at more than 6,280 linear feet. For more summer attractions, head over to the resort's Coca-Cola Adventure Zone for a ropes course, slingshot bungee jump, climbing wall, bounce house, mechanical bull, human gyro and spectacular views from the Mt. Werner gondola. Alpine adventure finds kids in Durango, as well. Their Inferno Mountain Coaster winds through steep fields of wildflowers good for leisurely or speedy rides. The park also hosts a zipline, scenic chairlift rides, a mountain-bike uplift, mini golf, ropes course, water runners and much more. Located near the American Flyer lift, Copper Mountain's year-round Rocky Mountain Coaster is 5,800 feet long and descends 430 vertical feet. If you're seeking another way for youngsters to burn some energy, head over to Woodward at Copper, an action sports paradise with skate parks, Olympic-grade trampolines, foam pit jumps, indoor ski and snowboard training and more.